Our floorstanding lamps are ideal for working on a sofa or for people who want to easily move the lamp around the house. The daylight™ light ensures clear lighting so you can read and work in optimal comfort. 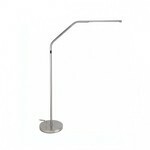 Most of the lamps are height adjustable to direct the light exactly where you need it.